At Christleton High School we believe in education is all about the whole person. Every pupil has the ability to achieve something worthwhile and excel in some field. Our sports programme is designed to help young people identify and develop what they are good at, leading them to greater confidence and self-esteem. Enjoying success in sport, at their own level, can often be the key to pupils’ success across the school. 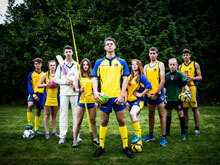 The School’s reputation for sport is outstanding, having produced many athletes who go onto play at District, County and National Level. 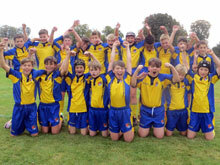 There many representative sports on offer to students throughout the year. In 2015 Christleton High School was named the Number 6 Sports School in England by School Sports Magazine based on results and upon closer analysis was the Number 1 Non-Selective Sports School in England. In the past three years the School has been consistently ranked in the top 1% of schools for competitive sports. Representative sports on offer include athletics, badminton, basketball, cricket, cross country, football, hockey, netball, orienteering, rounders, rugby, water-polo, rowing, swimming, table tennis, tennis and volleyball. With over 350 fixtures played every year and a large number of sports team, there is certainly a large and diverse range of sports providing opportunities to develop leisure interests that will last a student’s lifetime. We run regular tours and trips including Barcelona Football Tour, Condover Netball Camp, Ski Trip and domestic (e.g. Premier League Football Game) and international sports events (e.g. Six Nations Rugby Game). The pupils in KS3 take part in two hours of Physical Education a week. In Years 7 and 8, pupils will be in the swimming pool one lesson out of four with aqua-based lessons. In KS4, pupils receive one hour of Physical Education a week. Pupils can choose BTEC Level 2 Tech Award in Sports Leadership as an option at KS4 and in the 6th Form students can opt for the BTEC Level 3 National Extended Certificate. The academic Physical Education courses are very popular and allow students to experience trips such as the Ashbourne Games and Physiological Testing at leading Sports Universities. We offer the following sports to pupils at KS3 and KS4 in the curriculum and extra-curricular time.